We are beyond blessed when families who we’ve helped give back to Eden’s Garden. 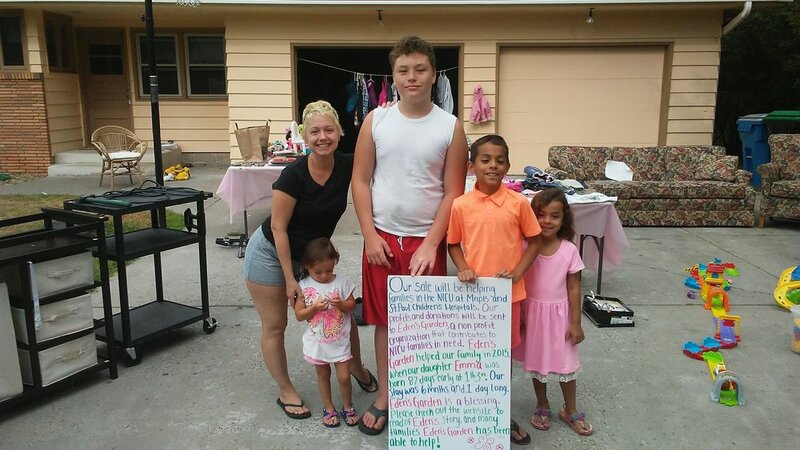 The Marical family decided to have a garage sale this fall and they donated all of the money raised to Eden’s Garden!! Here’s an update and some photos from the family (shared with permission). Hello! It has been 3 years since you have helped our family. Our daughter Emma had spent 6 months at St. Paul. Ended up with a G tube, a tracheostomy , and 24/7 home health care. We used our gift from Eden's Garden to buy furniture for Emma's room that would hold diapers and machines. I’m proud to say that Emma is now 3 and 1/2, and healthy as can be, developmentally right on track! She had many more trips to the hospital the first 2 years at home. And, with all that and trying my best to trust my home health nurses (I really did Emmas cares about 99% of time) with the exception to sleep and give love to my older 3. I was exhausted. Emma , however, strengthened her lungs quickly and was decanulated and reconstructed in Sept. 2016. The g tube was only in for a short time after we went home. She was finally free! Best of all my girl could hear her voice, and so could we! We also celebrated in January this year that Emma had been hospital free for one whole year!!!! And, odd enough, her favorite thing to do.....sing! We are blessed. Thank you for all you do for NICU families. On Friday, June 29th we welcomed our baby boy to this world. He made his arrival 14 weeks early, weighing in at 2 lbs 4 oz. He is proving to be incredibly strong and is certainly progressing in the right direction. There have been some ups,and downs, but thankfully, more ups than downs. His little body is working hard each and every day, and he now weighs double what he weighed when he was born. He will remain in the NICU until the time of his original due date in October, and is being cared for by an incredible team of nurses and doctors. We expectantly go to the hospital each and every day, looking forward to seeing our little boy. We have another child as well, and have minimized our time out of work now, in hopes of utilizing our PTO once our baby comes home. Maintaining jobs, and our bodies, is a juggling act, when it is combined with raising another child, and spending multiple hours every day at the hospital. God bless the people that are behind Eden’s Garden. The gift cards to Target, and area restaurants, have without a doubt eased the financial burden. We’re on the go a lot. Food cost for us has gone up substantially as we have minimal time to prep and cook meals at home. So, the EG support has been a blessing! Having a baby 3+ months early has been difficult. But through this process, we have seen the kindness of others in full force. Thank you so much Eden’s Garden, for all that you have done for us, and for people that are in similar situations. We truly appreciate what you have done. One of the NICU dads Eden's Garden recently helped sent us a story of his son, Reeve's journey in the NICU. We hope Reeve can go home with his loving family very soon after such a long rollercoaster ride. Thank you for providing us with the gas cards thru our social worker. Our lil "Superman" Reeve has been in the NICU for 111 days now. It's been an experience our family will never forget and we appreciate your support. Reeve was born at 23 weeks 3 days weighing only 1lb. 5oz. He's had several surgeries but appears to be taking them all head on and thriving. He's gained 5lbs. so far and looks to be growing into a happy healthy little boy. The NICU is a special place filled with many ups and downs but we've met some of the greatest people and made several new friends on this journey. The people who take time out of their lives to help people going thru times like this are a real blessing since with everything going on people's finances sometimes get put on the back burner to the more pressing issues at hand. On March 9th, 2017 I woke up with some back pain and bloody mucous. It had been a quite eventful pregnancy up until that point and I knew I had to go into the labor and delivery department once again. On our way to the hospital, I started timing my back pain and sure enough they were about 3 minutes apart. When we got to the hospital, they quickly did some tests and I was whisked away to Abbott Northwestern. I got to Abbott about about 9:30 AM and delivered Traeger at 10:53 AM. I progressed quickly from 2 cm to fully dilated. I pushed twice and Traeger was born. He was born at 25 weeks and 1 day gestation. He was 2 pounds, 1 1/2 ounces. He came out crying and he held my finger before they took him away to the NICU. In talking both with my ObGyn doctor and the delivery doctor, they found an infection in the amniotic fluid. They believe that Traeger's twin we had lost early on in the pregnancy and its dead cells caused the infection. The infection caused the early labor and possibly some of the other issues we've had with pregnancy. The delivery doctor noticed that the umbilical cord was very short and it was located on the edge of the placenta. All these things played a huge part in delivering Traeger so early. With small little bumps in the road and many successes to celebrate, Traeger came home on June 22nd, 2017. We received support from Eden's Garden at the end of our 106 day journey in the hospital and it couldn't have come at a better time. The support we received from Eden's Garden helped in our last few days at Children's and our transition home. We had to stop at Target on the way home to buy formula for Traeger and the gift card from Eden's Garden helped provide the sense of relief to provide Traeger what he needed without a financial burden. We thank Eden's Garden in supporting Traeger's journey home! On Mothers Day morning, 5/14, I woke up to use the bathroom and my water broke; I thought to myself this can't be happening she isn't due to arrive until the end of July! I arrived at United Hospital at 4:30am and I was told two things were going to happen that day, she was either going to be born or I would sit on bed rest at the hospital for 4 weeks.... well my daughter had her own plan and decided to arrive at 9:28 that morning. Zakiya was born at 29 weeks gestation and weighed 3 lbs 7 oz. Today Zakiya is still in the NICU working on botteling. She weighs 5 lbs 5 oz and continues to gain weight every day. Edens Garden was able to offer my family financial assistance in a great time of need and we are forever greateful for their generosity. *Thank you to Zakiya's mom for sharing her story. Alexis Rose born @ 35 weeks & 3 days weighing 3lbs 3 oz by c section due to growth restrictions. Within 24 hours being born they thought she had a bowel obstruction and needed surgery right away, they then learned it wasn't her intestines but that her stomach ruptured a way no doctor or surgeon has ever seen. We spent 6 weeks in the NICU while she recovered and were able to get her stomach to heal, stretch and take feedings. Alexis has been home now for 2 weeks about and has been doing amazing. Eden's Garden was so happy to help this family during their journey in the NICU. Hope you grow big and strong Alexis Rose! This sweet little one was born weighing only 1 lb 9 oz and Eden's Garden was honored to help this family during their journey in the NICU. Eden's Garden was blessed to help this sweet little girl and her family during her journey in the NICU. Thursday, July 21st is Eden's Garden Day at Granite City Food & Brewery! We are very excited to be partnering with Granite City on a delicious fundraising opportunity called Dine 2 Donate. The best part, it couldn't be simpler to join in the funs! All you need to do is head out to Granite City Food & Brewery at any time on July 21st and 10% of your TOTAL sales will be donated to Eden's Garden. And just like that you've worked to help support families on their journey while in the NICU! Who would have thought it would be so easy to do so much good? Dine 2 Donate includes all food, beverages, to-go sales and catering so don't hold back, you deserve a nice meal, right? Use the flyer below to let your server know you're there for the Dine 2 donate program and they will gladly ensure 10% of your total bill makes its way to Eden's Garden. How: Simply show your server the flyer (pictured above) to your server. They will accept printed flyers, guests showing a Facebook Invite or post of the flyers on their phones, a newsletter with the flyer, or an email! You can also find the flyer on our facebook page or in the facebook event- let us know you'll be joining the fun by RSVPing in the event! Please be sure to share this with your friends & family so they can join in the fun. Ramzi and Jax were born 8 weeks and one day early on December 26th, 2015. Ramzi was 3 pounds 5 ounces and Jax was 4 pounds 9 ounces. Both babies were doing great and had just started to eat from a bottle when Jax got very sick. The hospital called me at 1130 pm and told me that Jax had an infection and they had moved him to a different room away from Ramzi. I went to the hospital just for peace of mind and as the night went on Jax was getting worse and worse. The doctor intubated him to put him on a ventilator and ordered for x-rays for every 3 hours. They diagnosed him with Necrotizing Entercolitis. This is a very scary problem for preemies to have. The doctors stopped feeding him by mouth and started IV feedings. Jax was not able to eat anything for 10 to 14 days. He seemed to be getting better as they started to feed him by bottle again so they increased his food slowly. However, it didn’t take long and he was throwing up everything he ate and seemed to be sleepy all the time. The doctors stopped the feedings for him again and ordered X-rays again for every 4 hours this time to watch barium flow through his tummy. On the third day they noticed that the barium stopped at one point in his intestines. At this point the doctor said he would need surgery. Jax was then flown to Minneapolis Children’s Hospital, on January 26, 2016 at one month old. On January 29 they did exploratory surgery and found that Jax’s intestine had ruptured at some point and when it was healing and it healed close to another part of intestine. They removed some of his intestine where his blockage was and also removed his appendix. He was healing and we were just waiting for him to poop when the night nurse called me and said he had a stool but she was worried about it so they ordered an x-ray that showed some questions so they ordered another one with a different view. This x ray came back to show that his intestines had ruptured again where they had fixed the blockage and air and stool were loose in his torso he needed emergency surgery. The surgeon came to let me know they Jax did great and they gave him an ileostomy stoma that he would have for 8 to 10 weeks. A few days later Jax stoma started to work so they brought in a nurse to show me how to care for his stoma and change his ostomy bags. A few days later he was ready to come home J It took us two days the trip was very hard on him never having been in a car seat. While at home he started to lose weight and got an infection from his stitches we were told to wake him up every 3 hours to eat and antibiotics 2 times a day. He healed very quickly and started to gain weight! We scheduled his next surgery to put the intestine back for March 25th. Jax and I flew from Aberdeen. This surgery went as planned and again we were just waiting for him to poop. A few days later everything was working and they started food and preparing for him and I to return home to Dad and Ramzi. Jax and Ramzi are now 5 months old and doing great. I had just turned 20years old when I fell pregnant with Leo. I was very healthy, and so was my life partner and Leo's father, Austin. We expected to have a smooth, exciting pregnancy and a big healthy baby. I was diagnosed with severe preeclampsia at 25 weeks gestation. There were no apparent causes, we were told it can happen to any woman. I spent 6 days on bedrest at United Hospital, longing for my baby to be able to stay in at least another few weeks, but feeling miserable as my body retained more and more fluid and I was not allowed to leave my hospital room. On the last day, I was having increasing trouble breathing, and when an X-Ray of my lungs was taken, it was confirmed that the fluid had reached my lungs and that we would need to deliver immediately by an emergency cesarean. Austin cried, I was in shock. We were going to meet our baby boy that night, and we were less than prepared. The c-section was painless and rather a blur. When we finally heard our baby's cries, we both cried too, but he was taken away immediately before we could see him, to be cleaned off and hooked up to many, many tubes. For the next several weeks we watched our baby have many ups and downs. From not being able to cry out his uncomfortableness due to the breathing tube down his throat, to dangerously needing more oxygen than was possible to give him, and even at one point being told he may not survive all of this. Leo's nurses and doctors have been amazing throughout the past couple of months in the NICU, and we're so happy that after his last round of steroids for his premature lungs, all of his numbers dropped to healthy levels and he is nearly 3lbs bigger and chubbier than he was at birth. He continues to breathe on his own at this point, with slight help from his CPAP mask. He has very few steps left to go before he comes home with us, and being over that terrifying hurdle and onto so much progression is such a blessing. We're so thankful for all of the love, encouragement and support we've received from nurses, family, friends, and now the generous people of Eden's Garden. 2 months old (Finally on a CPAP and at 26% oxygen!) Weighing 4lbs 5oz today and continuing to thrive. Lincoln and Lily were born at 28 weeks on December 5th weighing 3.1 lbs and 2.8 lbs respectively. Their mom had a very traumatic birth and the physicians even asked mom and dad to decide between the lives of the twins and mom's life. Ultimately the c-section was emergent and mom was at risk but pulled through and did just fine. These twins though, they've done remarkably well. The physicians cannot believe how well they've done for 28 weekers. Neither required any long-term ventilation and they were on and off oxygen very rapidly. They learned to eat quickly and went home after only 7 weeks in the NICU! Lincoln is a calm and relaxed baby and loves music, people singing to him and being massaged after a bath with lotion. Lily is sassy and has a lot of attitude, she will let her mom know when she's hungry. Lily is usually alert and loves being talked to and told stories. The twins have four siblings who welcomed them home with open, warm arms. The twins are doing very well at home and Eden’s Garden was excited to help them with some baby items and other essentials during their journey in the NICU. The girls turned 1 on October 20th! And boy have they grown! Thank you for helping us with our long 5 month hospital stay. Tallulah and Lilly. Today is exactly one month since our precious baby came into our lives and rocked our world. It's amazing what can happen in just a month. In one month, our entire world was turned upside down. What we thought was going to be a normal pregnancy, ended up being anything but. After being admitted in the hospital for what we came to learn was severe preeclampsia and HELLP Syndrome, 5 days later I delivered via emergency C Section our tiny beautiful princess warrior, Lana Rose, at just 24 weeks gestation. At the time we had no idea what she was going to be like, only that this perfect little human came into our lives (early) and our hearts grew immensely with a strong, fierce and crazy love. We were told that she could have mental and physical disabilities, as well as potentially be blind and/or deaf, among other very scary things. What's worse, the doctors also told us that she might not make it. Little did they know that she is an Israel Grinberg. She is small, but boy does she have a huge personality and a zest for life! She keeps pleasantly surprising everyone, and has proved to us how beautiful and precious life is, and how special it is to become a parent. Most importantly, she keeps showing us that anything is possible. In one month, our relationship, which we considered to be pretty awesome, grew tenfold. We experienced things as a couple that tested our commitment, strengthened our love, pushed our boundaries and made us stronger than we ever thought possible. We faced tough decisions, incredible physical pain, and nerve-wracking moments of emotional anguish. In one month, we faced head-on the most challenging and difficult road that we've ever traveled on, both individually and together. And it's only the beginning. In one month, we've witnessed our baby grow and mature right before our eyes! From a tiny little red thing, no bigger than the size and weight of a can of soda, she is now over a foot long and weighs a pound and 5 oz. Her skin is no longer so transparent; it's much more opaque and has a lovely rosy hue to it. Her eyes are open a lot during the day, and she's quite responsive to our voices and touch. She knows what she likes and what she doesn't like, and has very quickly found ways of expressing her opinions to her nurses and to us! In one month, we've become truly humbled by our tremendous support group. From family to friends, to colleagues and acquaintances, we're finding out just how lucky we are to have the special people in ours lives that care about us and have gone above and beyond to help us with everything from meals to rides to the hospital. Friends and family far and wide and from all corners of the Earth are reading our updates and sending daily prayers to us and our baby. The amount of good vibes, warm wishes, and good deeds (mitzvahs) in our honor and in Lana's honor is so impactful and so appreciated. It really helps us to be strong and gives us the support knowing that we have so many cheerleaders and caring shoulders to lean on (even if only virtually) during this somewhat stressful and emotional time. In one month, our baby girl has become a fashionista with her first pair of booties today that her amazing nurse Tammy found for her! A girl's gotta accessorize and look fancy for this special occasion! One month down. We're not entirely sure how many months we've got to go in the NICU, but we're ready to face month two head on, and look forward to more good days ahead. And the best day...when we can finally bring Lana home! A big yawn from a little girl! Emma Rosalee was born February 3, 2015 and her journey in the NICU has been difficult. Her brothers and sister are anxiously awaiting her arrival home. At 1 lb 3 oz Emma has had issues including chronic lung disease which caused her to have a tracheostomy placed and eating struggles. Her family is anxiously planning every detail of her home coming with a home care nurse in their house 24/7, trach cares, and constant O2. Emma’s mom has been holding down the house with her other children and trying to stay strong but she came to Eden’s Garden for not only some financial assistance but to gather some helpful information about having a medically fragile child. The entire family is committed to making Emma’s bedroom, nursing area and play space exactly what she needs. Eden’s Garden was thrilled to support this family on their journey to bring Emma home. This little guy isn’t just a Prince, he’s a King! King was born April 18, 2015 at 37 weeks with a very scary defect called gastrochisis. This defect occurs when the abdominal contents protrude from the baby’s belly. King has been through a lot during his short life. King’s mommy calls him her little “dooda” and says he is the strongest little baby she knows. She said that he’s the true definition of a king and she couldn’t imagine her life without him. He loves to hear his mommy’s voice as she reads and sings to him and he finds comfort in a stuffed lion teddy bear. The family including a little brother is anxiously awaiting his homecoming. This family is on quite a journey in the NICU and Eden’s Garden is so grateful to help them. Please make a donation today so that we can help more families like King’s.